In case you didn’t know, it’s been a pretty damn good week for Klingons. Bing released its Klingon translator and partnered with CBS/Paramount and the KLI so this is pretty legit. I am, by no stretch of the imagination, fluent. I know a bunch of words and some fun phrases but that’s about it. That being said, it’s not perfect. The Klingon vocab isn’t anywhere near as extensive as English so if you try to translate something that doesn’t exist you might have to fudge it a little bit so that it would make cultural sense to a Klingon. You can combine the Bing translator with this amazing online Klingon dictionary and between the two be all set. So about that whole Into Darkness thing. . .
Here’s the thing, folks. I’m not a Star Trek purist. I got into it because of doing A Klingon Christmas Carol. I’ve since watched a bunch of episodes across all the different series but I haven’t seen any of the series all the way through (though it is a goal that I look forward to achieving someday). It’s actually one of the reasons I called this blog “Inclusionary Geek Girl”. Went to a 9pm showing of Star Trek: Into Darkness on May 15th…. I enjoyed the movie and it seemed like the whole theatre did that night, too. It was a nice ride of winks & nods to the show & movies, slick production, characterizations that didn’t get too campy, a nice twist with Khan, and the 3D really did look pretty damn gorgeous. Lens flare controversy aside, it was a good time and I think it will pave the way for more fans to the show. Is it cerebral & overly philosophical? No. It actually glosses over some rather hard issues but, let’s be real here, there’s multiple episodes of the tv shows that boldly go where the reboots do not and there’s a good chance that some of the folks who hit the movie theatre will take a chance on the show now. I don’t think JJ Abrams pulled a Star Wars prequel on it like some are accusing. There is nothing so offensive as Jar Jar anywhere unless you really really really hate the lens flares. So seriously. Go. Relax and enjoy the visual spectacle. 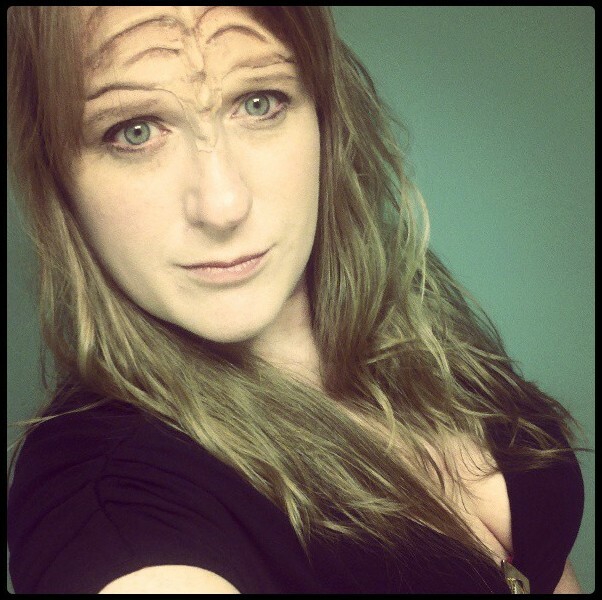 About that whole Klingon selfie thing. . . I dressed pretty normal in an all black outfit with some fantastic knee boots but added my Klingon comm badge to my cleavage in an attempt to give the Duras Sisters a run for their money (not so much). Then, because these sorts of disparate things make me giggle, I took some selfies (minus duckface). I dubbed it my “2013 Klingon Gal About the Terran Town” look. While I might not be the purist most would hope I am, I just really dig the Klingons. I love their warrior attitude. I love a race of people dedicated to the notion of living honorably. Gruff and straightforward, this is a race of folks who have a language built entirely in the present tense because — Heghlu’meH QaQ jajvam — “Today is a good day to die.” They fight fiercely but they also love, party, and drink fiercely, too. And that’s a rather romantic notion to me. 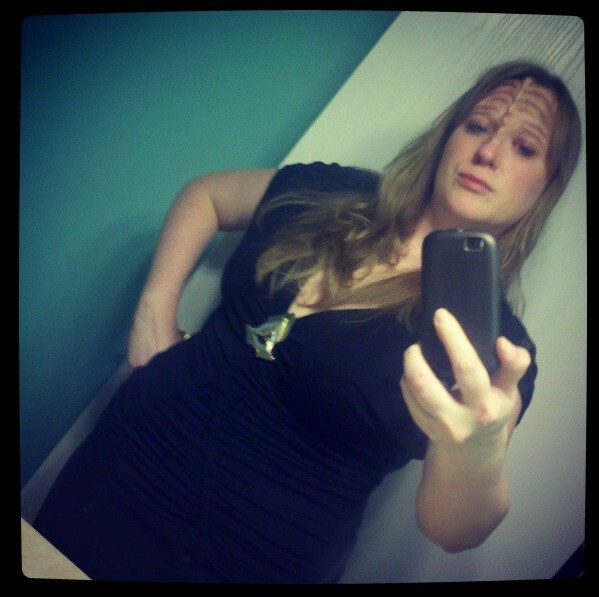 So why wouldn’t a Klingon woman of 2013 take some selfies? She’s going to be one proud mamma jamma. Thought you might enjoy this take on Star Trek.